Media and Contents: 265 pages, hard cover; portrait format (22 x 30 cm), loose sheet with full colour aircraft profile. 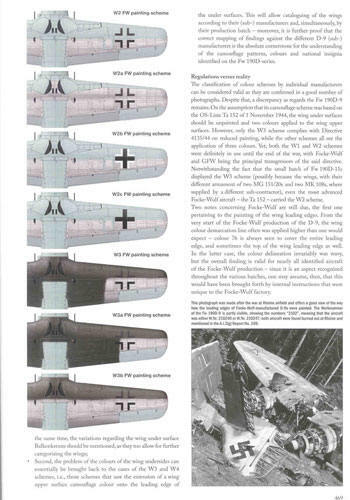 Advantages: Continuation of the most comprehensive analysis of Fw 190D-series camouflage and markings yet published. Part II of a three-volume set. Highly analytical approach to unravelling Fw 190D camouflage and markings schemes, identification of individual aircraft into specific production batches, comprehensive Werknummer listing, etc. Outstanding photograph collection (many previously unpublished) and superb colour profiles. Confirms this series reputation as the “Dora Bible”. Given the fact that this publication is the second of a three-part series, for the convenience of the reader this review follows the same format as the earlier one this writer undertook for Part I (2005) that is posted here on this website. The contents of the book pick up where Part I left off, beginning with an impressive discussion of the camouflage and markings systems for the three remaining Dora production facilities - Arbeitsgemeinschaft Weserflug, Mimetall Erfurt and Fieseler Kassel – and the separate Werknummern production batches within each which makes up the bulk of this book. The remaining third of the book discusses the oft-overlooked and poorly understood (and under-appreciated) subject of wartime restoration and adaptation of camouflages, and overview of aircraft operating with specific units, the German Air Force repair system. There is also a separate 15-page section devoted to the Fw 190 D-15 and related aircraft. A comprehensive listing is presented that includes the fates and related information on all FW 190Ds from the 400000, 500000, 600000 and 8000000 Werknummer series. The book concludes with a number of Appendices, Errata & Addenda for Part I, Bibliography, etc. The following is a precise of the books ten sections identified and detailed below. In their Introduction, the authors give an over of the results of their research methodology, and most usefully, a discussion of Fw 190D Production Timelines. This is a very useful feature as it neatly describes in table and text the temporal framework of Dora production over the last eight months of the war – September 1944 to April 1945. This section naturally occupies the largest section of the book and focuses on the description of camouflage and markings for Focke-Wulf Dora production from remaining three production facilities - Arbeitsgemeinschaft Weserflug, Mimetall Erfurt and Fieseler Kassel – from the 400000, 500000, 600000, and 800000Werknummer-series. Each of the batches within the respective series is described in detail with accompanying colour and b/w photographs, colour and b/w profiles and plans, official documents, etc. For each Werknummer series, colour profiles for each fuselage side, variations, and wing uppersurfaces are used illustrate the salient features. Within each batch, a number of aircraft are studied in detail with a discussion on its history, unit, camouflage, markings and stencilling. Period and recent photographs up to half-page size provide the interpretive dataset to unravelling the respective camouflage and markings schemes. Some aircraft are known from but a single photo; others from over a dozen images or have been preserved. Many are aircraft that are familiar to Dora enthusiasts, though with new information and images that lead to some surprising colour interpretations. These interpretations, as discussed in the text, are illustrated with colour and b/w plan and scrap views, and outstanding full-page artist profiles. As an example of the new information generated from this research, it is recognized that aircraft from the 600981-601110 series – transitional from the 600000 to 601000 blocks – have markings attributes from the 600000 series but have schemes that are slightly more reflective of the 601000 series. Furthermore, there are some interesting comments regarding the possibility that aircraft within this series may include recycled / repaired aircraft from other series. 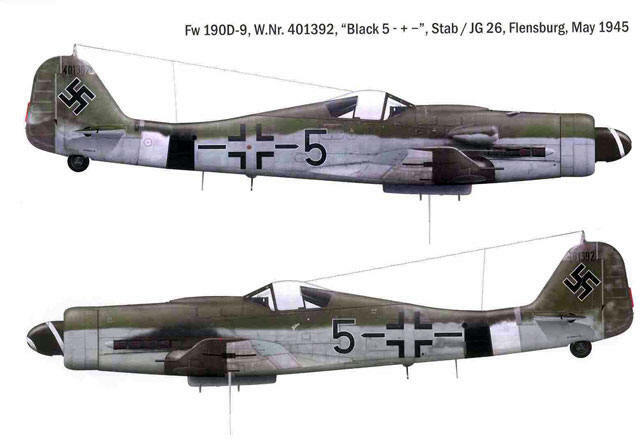 There is also a very comprehensive analysis on the Fw 190 D-13 from the 836000-series. The information and photos in this section could warrant a small publication on its own right and is probably the most current analysis of the aircraft and its camouflage and markings. 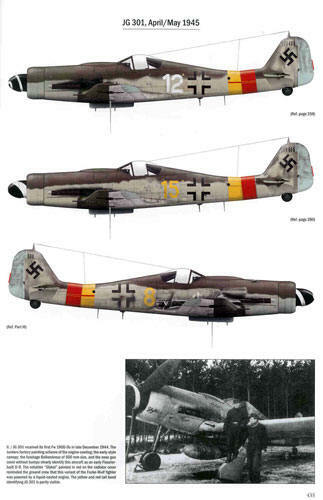 There are some rather surprising interpretations on the camouflage and markings of the surviving D-13 aircraft “Yellow 10”, WNr.836017 of Stab./JG 26. It is interesting to note the rather uneven distribution of subject aircraft within each Werknummer block and series. Some are very well represented with statistically large samples whereas others are described from a single aircraft. While there are several possibilities why this might be so, a cursory study of the Werknummer list suggests that this may be due in part to where a particular unit operated, with those on the Ostfront not having good photographic representation. The fact that the low numbers of sample aircraft, particularly in the 600000-series produced during the last months of the war when camouflage and markings variability would be most pronounced, should ring as a note of caution in attempts to interpret the camouflage schemes and colours for these aircraft. Yet, as the authors proved in Part I, in most cases these totals are statistically sufficient to permit a highly confident interpretation of the camouflage colour, schemes and markings for each batch. Their methodical analytical approach is reaffirmed in this volume as the textbook example of how such studies and should be studied. The authors use this section to delve into the not well-known system of aircraft repair and refurbishment by the Germans at major repair centres to the unit level. Five aircraft are used as illustrative example of the process and the results, on of which is none other than that old chestnut, “Blue 12”, WNr.500570 of 8./JG 6. This reviewer and his colleague Dave Wadman published a book (Experten Decals) in 1993 (!) that included analysis of this kite and we thought that there was little more to be learned about it. The authors’ re-evaluation of this machine proves how wrong we were. Other aircraft studied in this section are two from the 601XXX series and two others that have unknown Werknummern. A rather surprising addition is the treatment of the D-15 aircraft and its development. A detailed tabulation of all known D-14s and D-15s, along with data on the Jumo 213 and DB 603 engines, and the Fw 190D with the DB 603 motor completes this part of the book. Here, on a single page, the authors neatly encapsulate their research with an overview of camouflage colours and schemes used by the different manufacturers and units, with comments on the need for this book and directions for future studies. This final section is made up of eleven pages of tables chronicling every known Few 190 d is the aforementioned production batches. The table format contains information on each known aircraft’s Werknummer, date (of significant data), marking/code, pilot, fate, location/crash site, state, and action and remarks with approximately 40 entries per page. This extremely useful tabulation will expand as new information becomes available and included in Part III. 1. Wing under surfaces (6 pages): This is a most fascinating study of the poorly understood evolution of painting of the wings lower surfaces and the use of various dark upper surface paints. Sixteen variations are recognized and classified based on photographs and fragments. 2. Production batches versus camouflage colours (1 page): This brief discussion follows the evolution of the promulgated official camouflage scheme and colours and the results when brutal reality intruded. 3. Werknummern (1 page): This is another short overview regarding the designation of Werknummern to specific factories that also includes the use on Fw 190 As and Fs produced by the four Dora manufacturers. 4. Colours versus paint composition (2 pages): This is a section gives a very succinct summary of German aviation paint s, the manufacturers and the uses of various raw materials and substitutions over time. Overall, this is a very interesting discussion that should generate some interesting commentaries from enthusiasts. All omissions, errors, addenda and errata for Part I are presented here. Furthermore, it is noted that a similar list for all three volumes in this series can be found on the JaPo website. Like the first volume, Part II has its share of minor grammatical and editorial errors. For example, the heading for the 600121-600180 series is labelled “600111-600180”. It would be prudent for the publisher to consider having the final text proofread by someone whose first language is English to catch the few rather charming choices of words and syntax. This writer repeats his plea for headings of the various sections to have larger font sizes for ease in locating them in the book. The hoped for comprehensive Index in the review of the first volume has not made its appearance here but is still recommended; perhaps it might end up in final volume. Part III of the series is discussed briefly on the final page of the book. It will capture much new information that has, and will continuously be generated by these books, as well as extant information of the various manufacturers that could not be included in Parts I and II for space reasons. Additional topics will focus on Allied and Soviet testing of the Dora, detailed discussion on production methodology, new photos, profiles Addenda and Errata, and a chronological lost listing of all Fw 190Ds. A final bit in this section is the sensational news that the authors will include a paint chip chart of Luftwaffe colours created from original stocks of at least 10 recently discovered Luftwaffe paints. Little more is known of the discovery in the Czech Republic, except to add that there are considerable quantities, these being preserved in 55 litre metal drums, and that the paint appears to be perfectly preserved. Finally, as an extra treat, the book comes with a full-page size sheet with a colour profile of a selected aircraft. This writer recommends that JaPo consider marketing these as packages as they are most suitable for framing and display. As mentioned in my previous review of Part I (2005), these are indeed the best of times for Dora fans. With the completion of this three-volume opus, there will be over 800 pages devoted to the camouflage and markings of the Fw 190D-series aircraft. The highly complimentary two volume series by Eagle Editions on the Dora further attests to the popularity of the Dora. Indeed, one is left to wonder if there is possibly anything left to say about this aircraft! In conclusion, this book is yet another outstanding contribution to knowledge on Luftwaffe camouflage and markings specific to the Fw 190D-series. The JaPo series cements its reputation as being indispensable to anyone interested in the aircraft, setting the standard for the analytical analysis of aircraft camouflage and markings. This is all packed and presented in a comprehensive and readable format and at an attractive price. With this new volume, the authors continue to meet the highest standards of scholarship in describing the evolution of Fw 190 D camouflage and markings, with more to follow. Kudos again to Mark Deboeck, Eric Larger, Tomáš Poruba and the JaPo team for creating this outstanding publication. Sincere thanks to Ales Janda of JaPo for the review copy of this book.